I'm Dr. Jane Goodall. I'm a scientist and conservationist. I've spent decades studying chimpanzees and their remarkable similarities to humans. My latest project is my first-ever online class, focused on animal intelligence, conservation, and how you can take action against the biggest threats facing our planet. You can learn more about my class here: www.masterclass.com/jg. What is the secret to your health? You are still so active at what most would consider an old age. Also, thank you for all your groundbreaking work to further science and benefit humanity! I was born with good genes. That is really important when you think about health. For the rest of it, I don't really think about my health. I live each day, and I've been really lucky to be extremely healthy. My two daughters (6 & 3) are huge fans of yours, and have read about you in both 'The Watcher' and 'Rebel Girls'. They have an explorer outfit they use to pretend they are you. Mathilda (6) would like to ask you: "How did you manage to get so close to the chimpanzees? How did they settle down around you?" Philippa (3) would like to ask you: "Do you have any pets?" PLEASE NOTE: Response is from a member of Dr. Goodall's team, and not from Dr. Goodall herself. First off, thank you so much for nurturing a sense of scientific curiosity within Mathilda and Philippa, and for providing them with powerful female role-models (including yourself, of course!). For Mathilda: Dr. Goodall will tell you that she was able to get close to the chimps due to her overwhelming patience and by staying very quiet. For months, they would run away in fear of her, but after a time they came to realize that she posed no danger to them. The chimpanzee, David Grey-Beard was the first to become relaxed around her after exploring her campsite. For Philippa: Dr. Goodall does not have any pets of her own because she travels over 300 days a year and thinks it wouldn't be fair to an animal to leave them alone for that long. Her family has two dogs however, and she is always around animals whenever she travels, so she is never alone! What was the pivotal point in your career where you decided that you absolutely wanted to study primates in the field? What were the reactions of your peers? Well, I first decided I wanted to go to Africa and live with animals and write books about them when I was ten years old. And everybody laughed at me, how could I do that, Africa is so far away. In World War II we had very little money. I was simply a girl. They told me girl students cannot do that. But I had a wonderful mother who had supported my love of animals ever since I was born, and she said to me if you really want to do this, then you're going to have to work very hard and take advantage of opportunity. That's the message I take to young people all around the world today, especially to those in under served communities. The studies of chimpanzees I discovered from the paleontologist Louis Leakey who wanted somebody to go with him and study chimpanzees -- he believed we shared a common ancestor 6 million years ago. What would you say was the biggest highlight of your career? Well, one highlight that really enabled my career to take off was discovering the chimpanzees used twigs and the brush to find termites in the underground nest because that is what went into "National Geographic," which ended up providing funds for me to continue my research. So in a way, that was the pivotal observation that actually enabled everything else. To what extent can the vocalizations and gestures of chimpanzees be converted or translated into a language? Has progress been made translating this? There is no question that chimpanzees have a very rich way to communicate many emotions, and information about the environment. But, I don't think we can translate that into anything like human language. However, chimpanzees can actually learn human-type languages. They can learn American sign language, 400 or more signs, and they can also learn quite sophisticated communication systems using computers. We keep destroying our environment and the beautiful creatures that share it with us. How do you keep your chin up and remain optimistic about where humanity is headed? It's tough these days, and I'd love to hear your perspective. As we look at what is happening in the world today, it is very, very grim. And because of that, a lot of people feel helpless, feel hopeless, and so they do nothing. And they fall into apathy and despair. So I have reasons for hope. I will share them quickly. One is the energy, commitment, and determination of young people and they are empowered to take action in programs like Roots & Shoots. Secondly, the human brain. We have this extraordinary weapon. We are finally beginning to use it to create clean green energy and find a new way of interacting with the environment and live in harmony with the other creatures. It's very strange, in fact the most intellectual creature to ever walk the planet is destroying it's only home. And I believe there's a disconnect between a clever brain and the human heart and compassion. Only when the head and heart work in harmony can we reach our true human potential. And this, I believe, is to come. From the resilience of nature, we can help to once again support life. Animals are on the very brink of extinction and we have to give them another chance. Next there is social media, which as we all know can spew out a lot of rubbish and misinformation. But, used in the right way, it means that for the first time in human history, we can bring people to together around the world who all care about a particular issue like climate change so that there can be hundreds, thousands, millions, eventually billions of people all raising their voices and demanding change so that we can make a big difference and politicians will have two listen and will have to make change. And finally, the human spirit. People who tackle what seems impossible and never give up. It's so important to realize that every single one of us has that same indomitable spirit. We just have to nurture it and let it grow to make a bigger impact for good. What was the most surprising thing you found while studying the similarities between chimpanzees and humans? I'm not sure about the most surprising, but the most shocking was the fact they are capable of war. This was very horrifying and actually made them more like humans than I thought they were before. I have heard that you have also discovered that they are capable of altruism, such as adopting orphaned infants. Can you tell us about that? Hi there! In Gombe we have witnessed acts that could be considered altruistic on various occasions. One example being when an orphaned 3 1/2 year old chimp, without older siblings (whom sometimes adopt their younger siblings) was taken in by an adolescent male around 12 years old. The older male allowed the orphaned chimp to follow him around (even making sure he kept up while they were on the move), allowing the orphan to cling to his underbelly when the orphan was scared and/or cold, and even allowing the orphaned chimp to sleep in the same 'night nest' as him. This is especially interesting considering that the adolescent male was not related to the orphaned chimp in the least. What do you want the world to see your work for? First of all, I would like to be remembered for helping to enable people to understand that animals are like us, their intellect and they have emotions like fear as well. Because up until the mid-'60s, it was actually thought that there was a difference in humans and the rest of the animal kingdom. And it was the work coming in, the early work, showing in how many ways the very biological system DNA and so forth that really changed. The other thing I hope to be remembered for is creating an environmental humanitarian program for people with Roots & Shoots, which is now in 100 countries. It involves members from preschool, kindergarten, universities, and everything in between. Its main message is every single one of us can make a difference. And make a difference every single day. Each group chooses themselves to help animals and wanting to help the environment. To educate young people to be better students, all the conservation work and other organizations to could benefit. And we've gone so far as destroying the planet, so the main hope is that the other people will grow up and do better than we've done. What would you say are the main topics in science that need to be explored deeper right now? I think there's a growing tendency to explore the intellectual ability of all kinds of different animals, and now we even know trees and plants can communicate through pheromones spreading messages in the wind or through micro fungus in the roots sending messages through the ground. And because science has now opened its mind to the possibility of intelligence in creatures, we are learning so much more and it's a very exciting time. What are you most proud to see change in the world over your lifetime? When I flew over the national park in the early '90s and looked down, I was utterly shocked. What had been stretching to the West Coast was now a tiny island surrounded by completely bare fields. People too poor to buy food from elsewhere. And struggling to survive. That is when it hit me. If we don't improve the lives of these people, there is no way we can conserve the chimpanzees. And that led to the Jane Goodall Institute program. We went not as a bunch of arrogant white people telling the villagers what to do to make their lives better, but with a hand-picked team sitting down, listening to the villagers, and asking them what they thought we could do to improve their lives. And that led to a very holistic program, which gradually grew and we could introduce new ways of helping. This paid off handsomely. The people in the villages are now our partners, helping us in conservation efforts. They've agreed to have a buffer between their villagers and the park to protect the chimpanzees. And the national Park, which was completely isolated, is now gradually being linked to other groups. And this program is now in 52 villages in the Gombe area, and it's in five other countries. And it is making a huge difference. Positive in introducing the youth program reaching the villages. It's probably the most important way in which we are able to conserve chimpanzee habitats. And I'll add to that, I would say we have placed great emphasis on education, helping them stay in school beyond puberty. We do this because it's been shown all around the globe that we all improve as women's education improves. One of our problems today is a growing number of humans. As our numbers grow, there are impacts and finite resources leading to more and more poverty and hunger. My favorite colour overall is green. There are times I like blue as well. I'm wearing blue today, by the way. As a scientist and researcher, how do believe we can make a positive impact on the environment we currently live in considering the large amounts of damage already done to the earth? I think that we can only make a real difference if everybody wakes up to the fact that we have caused terrible harm to the planet, and we need to rethink the way that we live in the Western world. We've fallen into a very materialistic, money-oriented way of living, and its placing enormous stress on the natural world. It's unsustainable, and we are told many of the nonrenewable natural resources are being exploited and used up faster than mother nature can replenish them. So, basically we all need to think about the consequences of the life choices we make each day. What do we buy, what do we wear, what do we eat, how is it made, is it from the environment, is there cruelty to animals or cruelty to children? And make choices thinking not only about how is this good for me now, but also how will this affect future generations. In other words, we need to do our part in the decisions we make, in our hearts and in our heads. Hi Dr. Goodall, My four year old loves reading. She asks what is your favorite book? When I was growing up, what I read where the Doctor Dolittle books. I learned a great deal from those books. When I was ten years old I read "Tarzan." I was sad when he married the wrong Jane. It was those books that directed me to grow up, go to Africa. For a 4-year-old child, one of my books I absolutely loved was "Jane" with illustrations by Patrick McDonnell. Which is fantastic. Another one, I want to mention is "My Life With Chimpanzees" which is a book I wrote for young children about my life with chimpanzees. I am an aspiring environmental scientist. Would you say conservation of natural resources or the protection of species is more important? I'm trying to figure out where I can do the most good. I have already said that we can make a big difference by thinking about the consequence of the choices we make each day. Like what we buy. When it comes to what we eat, there is growing evidence that as more and more people and countries around the world eat more and more meat, this is not only involving tremendous cruelty to all the animals, but it's also having the most appalling effect on the environment. People don't always realize this. For one thing, areas of the world have been cleared to grow grain to feed the animals. And massive fossil fuel is used to take the grains to the animals and to slaughter the animals. Huge amounts of water, which is becoming increasingly scarce around the world. Huge amounts are wasted changing vegetables to animal protein. And finally, these animals, like us as well, food goes in one end and comes out the other. They belch as well as pass gas. Nothing is second most, it is very, very lethal. Of course, this is all leading to climate change and other great -- it is the greatest environmental issue facing our planet. One thing that is very, very helpful is to eat less meat or become a vegetarian or a vegan. Are you vegan, Dr. Goodall? I've read mixed answers on this. Dr. Goodall has been a practicing vegetarian for many many years now. Although she does love cheese, so not sure she'll become a vegan anytime soon! Do you think there is a viable way to effect change in conservation without going into the field? There are various ways. One, spread awareness about the program. Two, to become involved in your program or other programs around the world. And you can do this also by raising funds to help programs that desperately need it including the Jane Goodall Institute. Thank you for holding this AMA. Is it true you were a fan of this far side comic? Sorry that it's not a great question. I couldn't think of anything else, and I've always kind of wondered about this. Dr. Goodall actually has no issue with the comic and thinks it's rather quite funny. Gary Larson eventually ended up visiting our Gombe Stream Reserve in response to the comic and was even attacked by the male chimp, Frodo, who Dr. Goodall has always claimed to be a 'bully' male. This AMA just made me giddy with excitement! 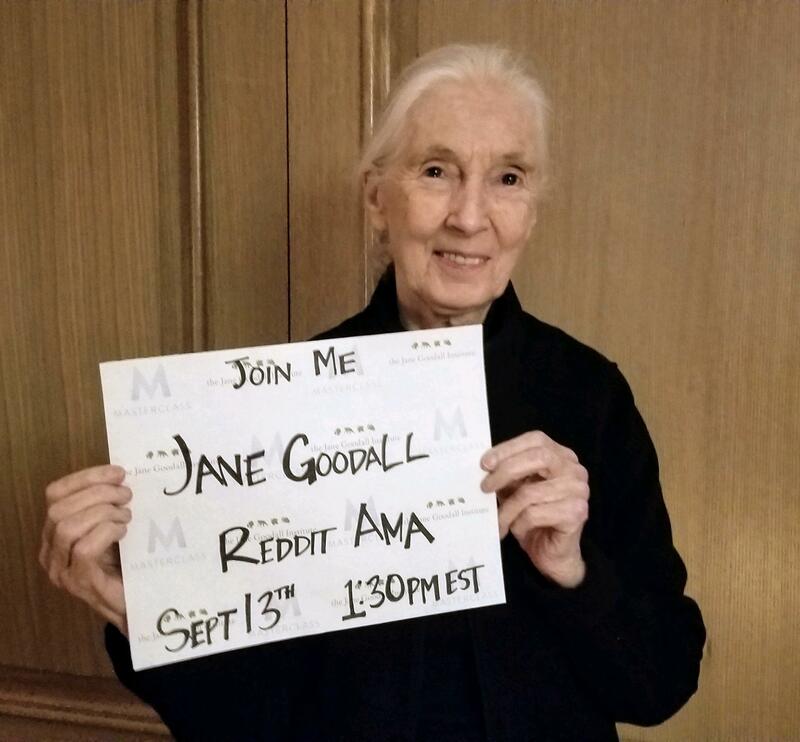 Dr. Goodall, when I was little, I wanted to be you when I grew up and I am so excited to see you on here. Of course I'm interested in your work but I'd love to know more about your activism. What would you say are the most effective ways people can get involved? For folks with small children, what would you recommend in order to get them involved too? Thank you for being the person I looked up to for so many years (and still do!) and the person that taught me it was more than okay to deeply care about animals. Wishing you well. Thank you for your kind words regarding Dr. Goodall! She will tell you 10 times out of 10 that the best way to get your children involved is to join our Roots & Shoots program! It is Dr. Goodall's youth service program that focuses on respect and compassion for all living things, understanding of all cultures and beliefs, and inspiring each individual to take action to make the world a better place for people, other animals, and the environment. The program has just recently been introduced into it's 100th country and continues to grow everyday. Some advice she gives to everyone who asks though, is that you must think and act locally. Focus on issues in your own community. Map out any potentially hazardous areas (polluted rivers, beaches, parks) and gather support from there. If everyone were to focus on their local communities, then the impact would eventually be global. Dr. Goodall tends to mostly listen to classical music. Do you believe in Sasquatch? Have you studied the Skookum casting or any of the new print samples with dermal ridge evidence? If you do believe do you think this group is a holdover of Gigantalopithicus Blacki? or a new Species? Jane has said that she is fascinated by the idea of the existence of an as of yet undiscovered ape species living in the wild. As a self-described romantic, has always wanted them to exist. She has read many accounts of bigfoot sightings and thinks that bigfoot is a real possibility. What do you think of the planet of the apes movies? While I can't speak to her opinion of the original films. Dr. Goodall did have a chance to pre-screen the newest POTA movie and found it very interesting. All of us at the Jane Goodall Institute are very appreciative of the steps taken by the production team of the new movies, due to their use of motion-capture and their dedication to not using real apes in any of their films. Long answer short, she loved the newest film!